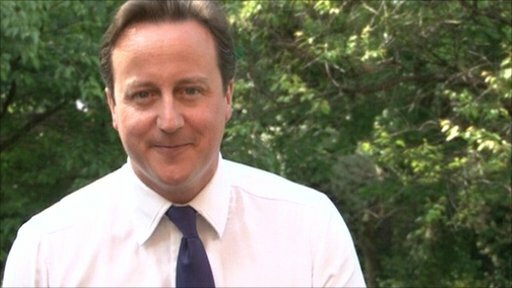 David Cameron: "Come on England!" Millions of people across the UK have watched the England football team open their World Cup campaign in South Africa with a 1-1 draw against the USA. The British Beer and Pub Association expected nearly four million fans to head to pubs and big screens were set up across the UK for public viewing. Prime Minister David Cameron offered support in a video message to the team. ITV apologised after an "interruption" on its high definition service meant viewers missed England's opening goal. During the half-time break, presenter Adrian Chiles said: "Apologies for those watching in HD, I believe there was some interruption in your coverage." England captain Steven Gerrard scored after four minutes in Rustenburg, with USA registering an equaliser just before the interval. England goalkeeper Rob Green fumbled a long-range shot that trickled over the line, before a goalless second half left each team with one point for a draw. In the UK, thousands of people were expected to watch the game on big screens in venues such as Millennium Square, in Leeds, and the Hammersmith Appollo, in west London. The hype may not be quite as all-consuming as it is in England, but the US is taking the World Cup seriously. With the time difference meaning matches are much earlier, bars in places like New York and Washington DC will open at 7am for the benefit of fans. There will also be outdoor screenings. There's a wealth of coverage in newspapers and key matches like today's from Rustenburg will be on ABC, the equivalent of ITV or BBC. Then there is blanket coverage on the ESPN sports channel, with British commentators like Martin Tyler and Ally McCoist brought in. Yes, Americans still insist on calling football "soccer" to distinguish it from American football, but there is plenty of evidence that World Cup fever is taking hold. One newspaper columnist went as far as joking that an England defeat on Saturday would be the biggest American-inflicted humiliation since the battle of Yorktown in 1781. And up to 3,000 people were due to watch the game on big screens at Great Notley Country Park, in Essex. Meanwhile, US servicemen and women based at Mildenhall airbase were cheering on their countrymen. The British Beer and Pub Association predicted that nearly four million fans flocking to pubs were likely to generate a £35m sales boost, with an extra nine million pints of beer sold. And supermarkets were expecting their busiest day since Christmas. Sainsbury's said it had prepared for a 500% increase in pizza and pint glass sales. In addition to his video message, Mr Cameron gave his backing to the FA's England Football Day campaign, which aims to encourage more people to take an interest in the game. The prime minister said: "I want to wish the England team and Fabio Capello every piece of good luck for the whole of the World Cup, but starting with tonight's vital game against the United States of America. "I keep saying we are all in this together, and that is particularly true when cheering on the England team." The prime minister has agreed that the England flag will fly over Downing Street for the duration of the World Cup. Fifa president Sepp Blatter says the World Cup in South Africa can already be rated a success.